ABarcode for Access 10.2.1 - Download Win Apps. ABarcode lets you to print bar codes in your Access reports. ABarcode is a MS Access add-in that allows you to convert any information in Access reports into bar code symbols. Supports EAN-8, EAN-13, UCC/EAN-128, Code 11, Code 128, Code 39, Code 93, CODABAR, UPC-A, UPC-E, Interleaved 2 of 5, POSTNET, PDF417, QR Code and Code 16K. 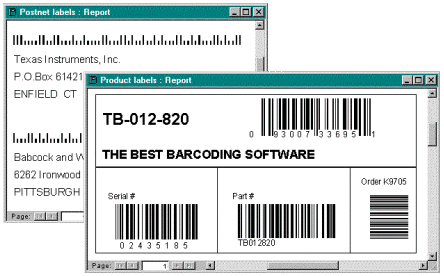 Several bar codes of several types can be included in any section of reports and subreports. Available versions for Access 97, 2000, 2002, 2003, 2007 and 2010.